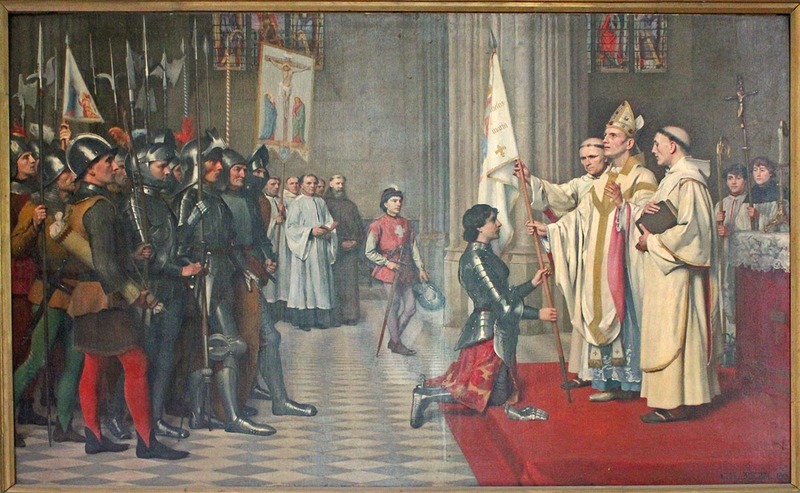 This is a painting of Jeanne d'Arc (Joan of Arc) being received in Blois. The work (a rather large painting) hangs in the chapel on the castle grounds. The interesting thing about it is that it was painted by the grandfather of our friend CHM (who is also a frequent commenter on our blogs). Joan of Arc, in battle armor, kneeling before the clergy in Blois. 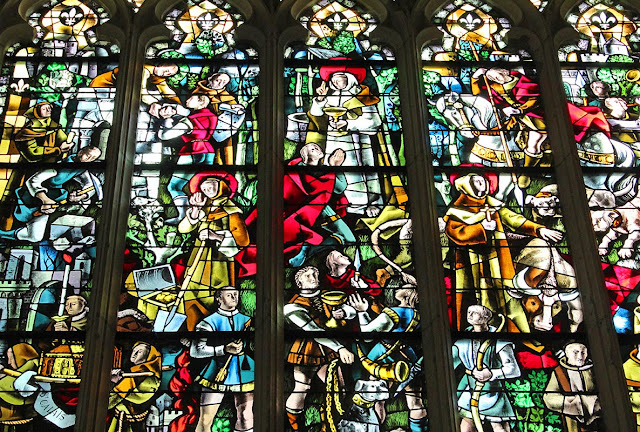 Jeanne d'Arc (Sainte-Jeanne pour les intimes) is a legendary figure in France's history. She led many successful battles in the Hundred Years' War (which, according to Wikipedia, lasted 116 years) and spent a lot of time in what is now central France before being tried, convicted, and executed as a heretic. Jeanne was burned at the stake in Rouen, Normandy, in 1431. She was nineteen years old. Throughout our region you can find plaques indicating that Jeanne d'Arc fought here, traveled there, or spent the night in this or that building. They remind me of the ubiquitous "George Washington slept here" signs you find in the eastern United States. Just off the courtyard inside the Château de Blois is what remains of the royal chapel built under King Louis XII in the late fifteenth century. Most of the building was demolished when the castle's classical wing was constructed about two-hundred and fifty years later. 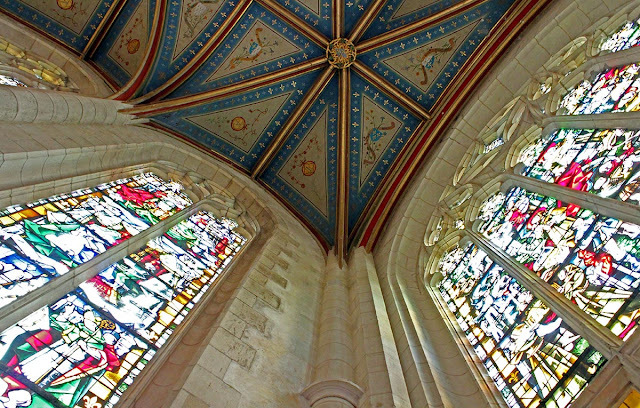 The Saint-Calais chapel's brightly painted vaulted ceiling. 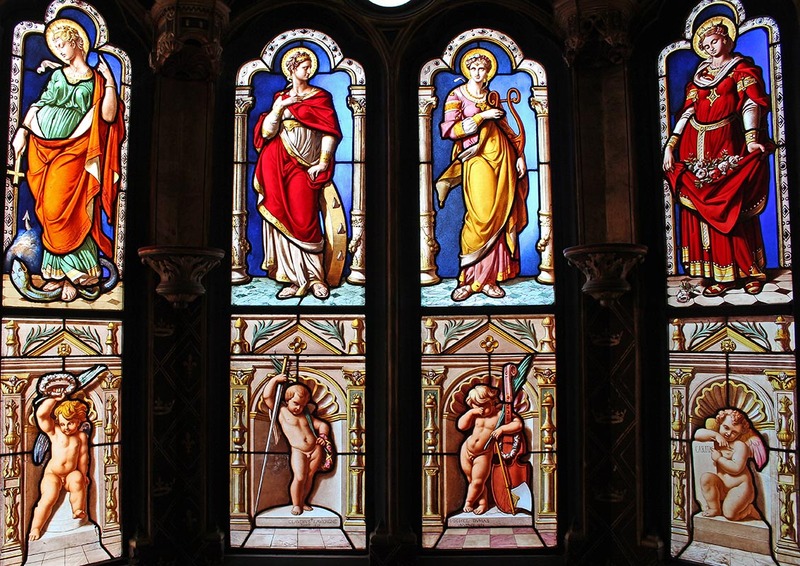 A portion of the 20th century stained glass work. 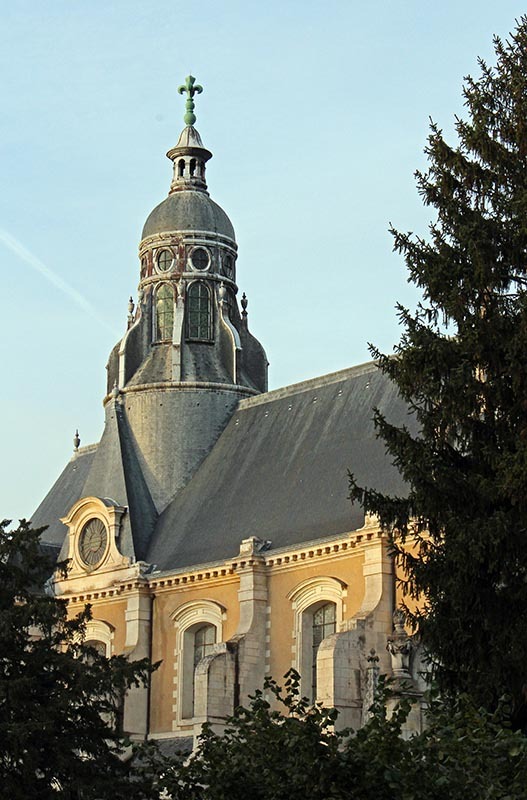 Here's another of Blois' many churches, Saint-Nicolas. 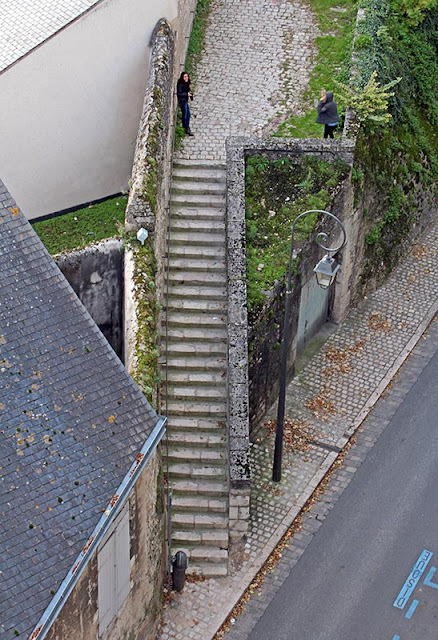 This one is built down below the château, closer to the river. 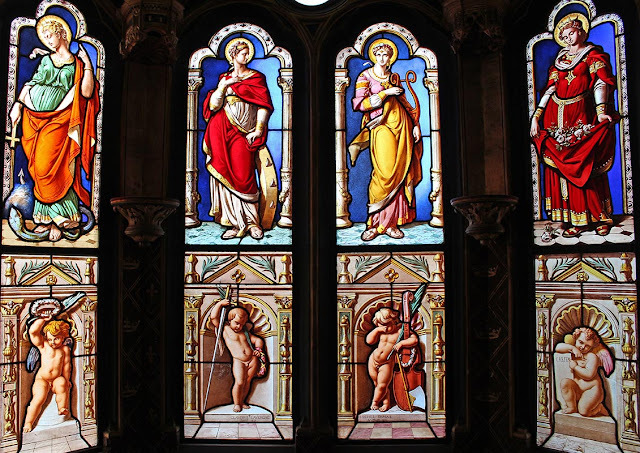 It was begun in the twelfth century as part of an abbey complex and was completed early in the thirteenth century. The other parts of the abbey were destroyed in subsequent religious wars, but they were rebuilt in the seventeenth and eighteenth centuries. L'église Saint-Nicolas on the Loire River at Blois. I should mention again that Blois is the seat of un évêché catholique (a Catholic bishopric or diocese) and as such is home to a cathedral as well as these churches. The cathedral is located up on another bluff across town from the château. I've noticed that I have a couple photos with the top of the cathedral's tower in them; I may post them later. 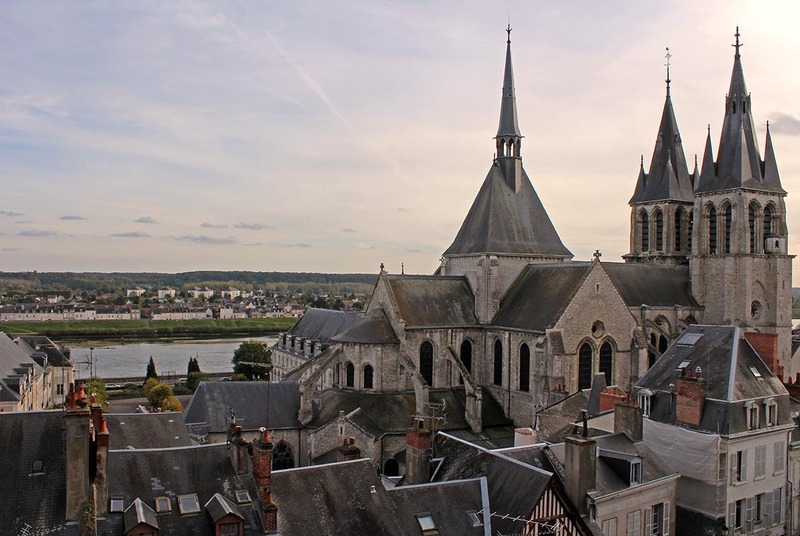 Being a city of about fifty-thousand people, Blois has, in addition to its cathedral, many churches around town. 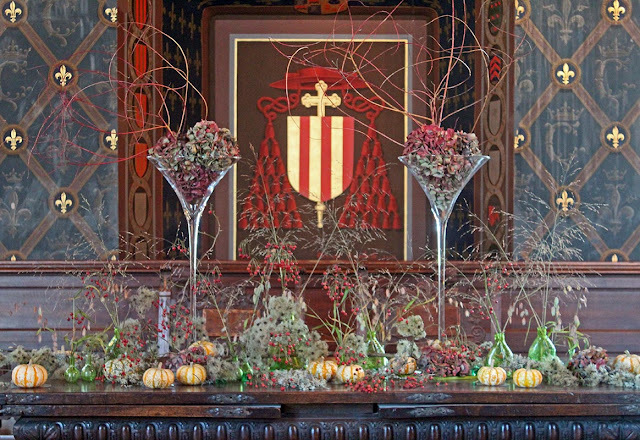 This is one of them, the Church of Saint Vincent de Paul. It was built in the mid-seventeenth century and is just across the way from the château. The setting sun lights up the western flank of the church. I've not been inside, but it might be worth a look one day. I snapped this picture as we were heading back to the parking lot after visiting the castle. 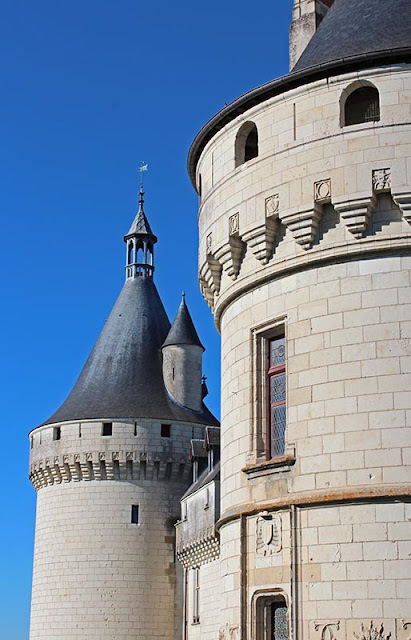 The Château de Blois is a royal residence first constructed in the middle ages. It has been subsequently rebuilt and added to over the centuries and is an amazing agglomeration of architectural styles. I visited it for the first time a couple of weeks ago with friends from California. 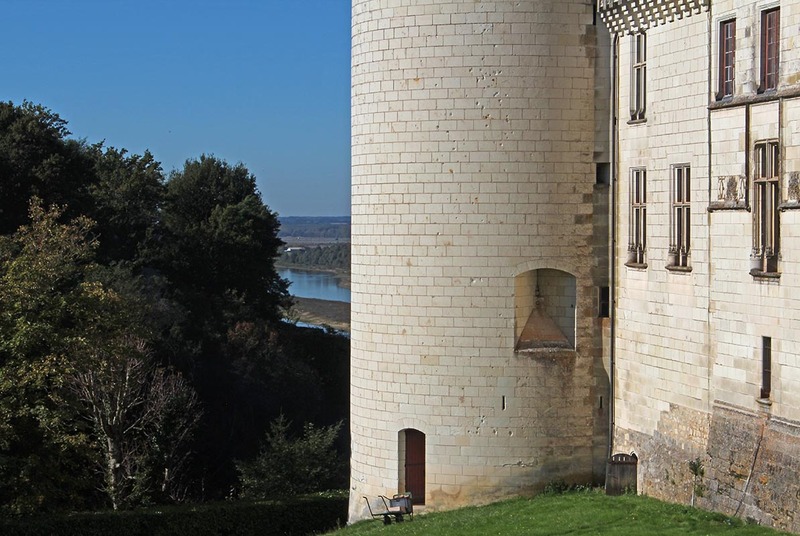 The castle sits on a bluff above the river (nothing unusual there) and is surrounded on all sides by the city of Blois. This is the renaissance wing of the Blois castle. It's fun to wander around in. I have to say that I'm amazed that I haven't been inside the castle until now. I've been coming to France since 1981 and I've lived in this region for nearly ten years, and still, this was my first visit. I must also say that I was very impressed. 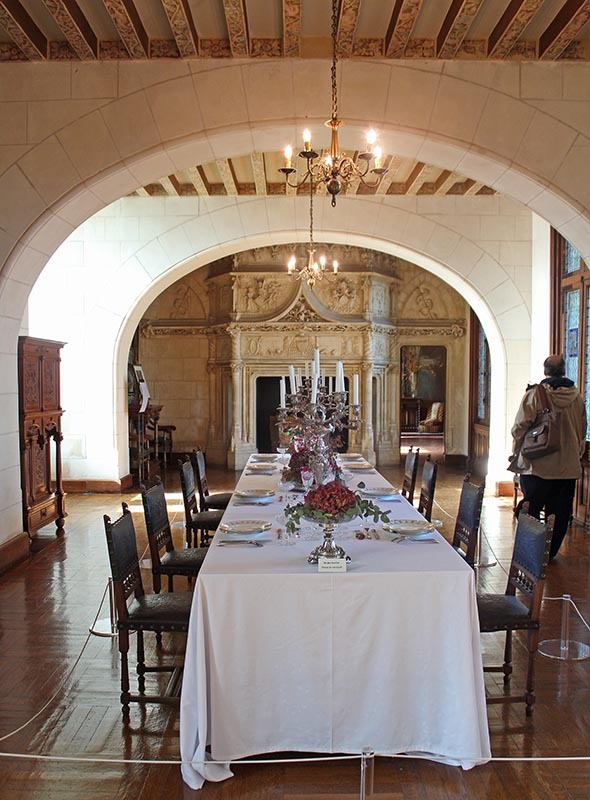 It's a great château to visit and I recommend it. I'm sure I'll go back before too long. 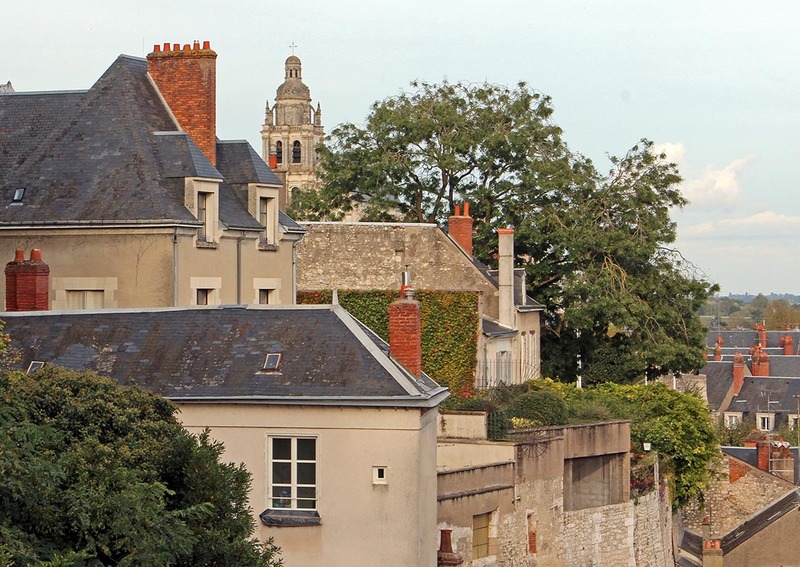 The city of Blois is the "capital" of our départment, le Loir-et-Cher. It's the largest town, with a population of just less than 50,000. It's a pretty little city on the banks of the Loire River, and its history as a royal city is well known in France. 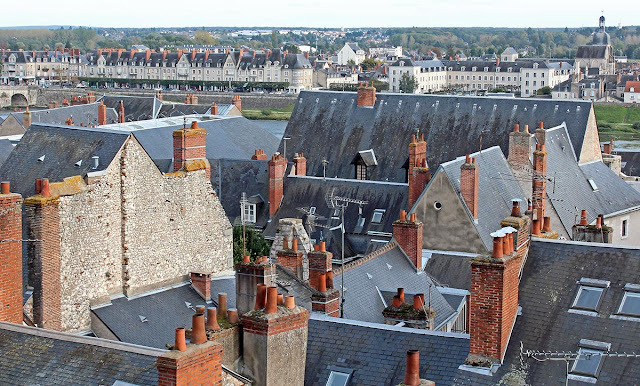 Rooftops in Blois, looking south from the castle across the Loire River toward Blois Sud, on the river's left bank. 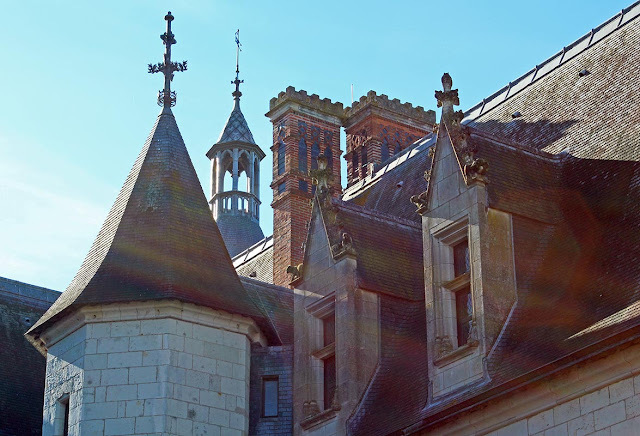 Blois is not far from the fantasy hunting lodge that King François the First built at Chambord. 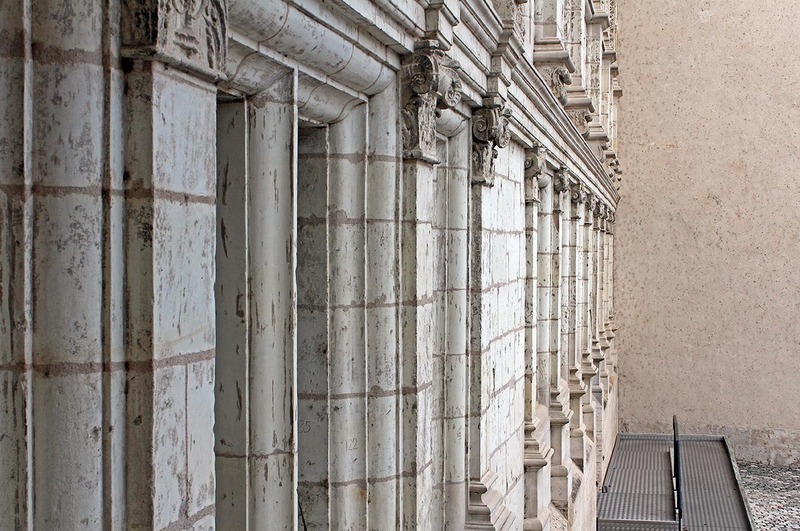 The Château de Blois was the royal castle for quite some time during the French Renaissance. Get ready for a bunch of photos from Blois. This is the last one for now. 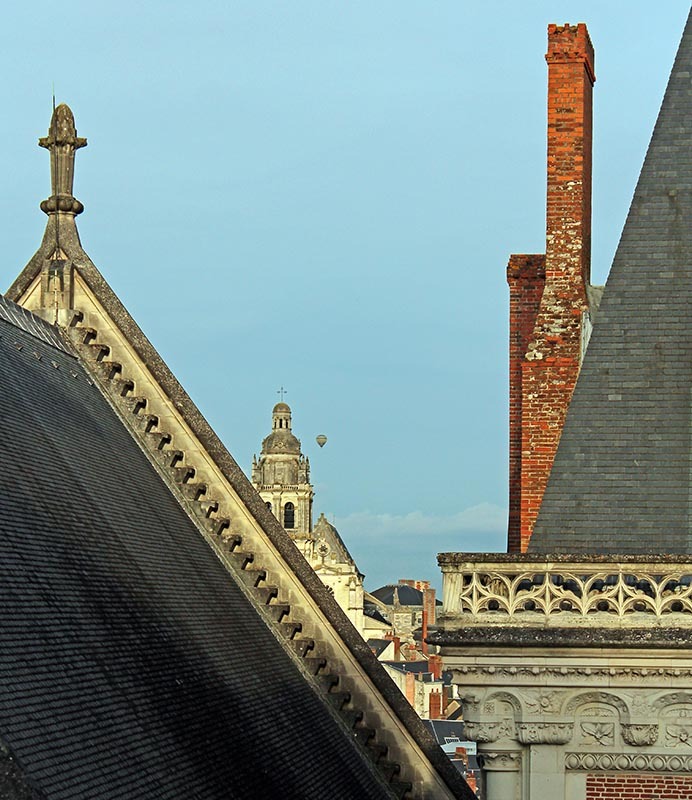 Another view of the "wedding cake" rooftops that characterize this renaissance château. If you pay to go inside, one of things you get to do is climb up onto the terraces at the base of these roofs and wander around. In my opinion, it's one of the best parts of the interior (although, technically it's on the outside). If you look closely (lower left) you can see people on the rooftop terrace. Click to over-the-topify. We're still spending a lot of time on the internet reading about the US election results both on the national and the local levels. This was an historic election year on many counts! 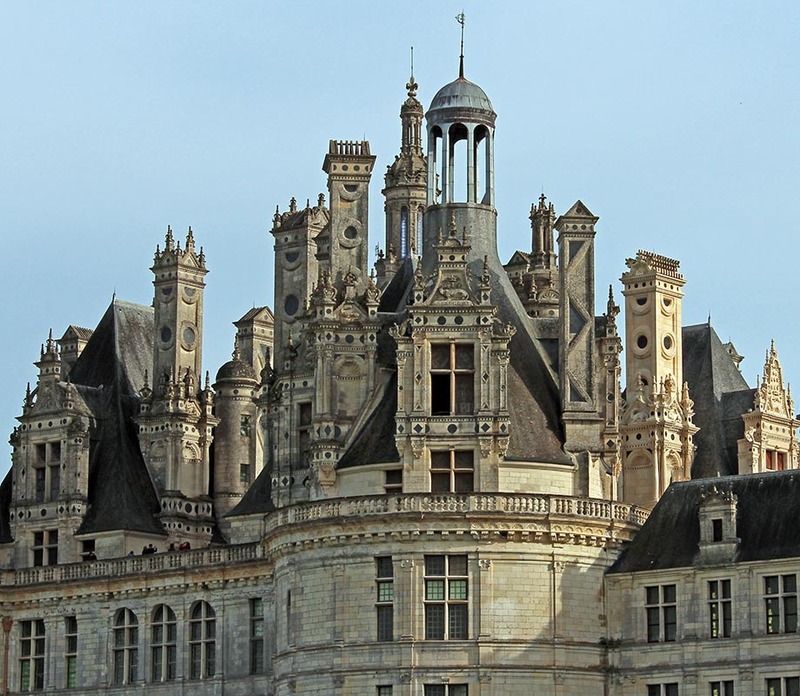 Here's a part of the Chambord castle that's less ornate than the central section, but still quite impressive, in my opinion, as it wraps around the building's southern courtyard. This part of the château is not open to visitors. I wonder what they keep in there? Ken and I have been up since 4:30am watching election returns on the computers and on CNN. What a morning! As usual, I took a bunch of photos on my most recent visit to Chambord, so you get to see a few of them here. 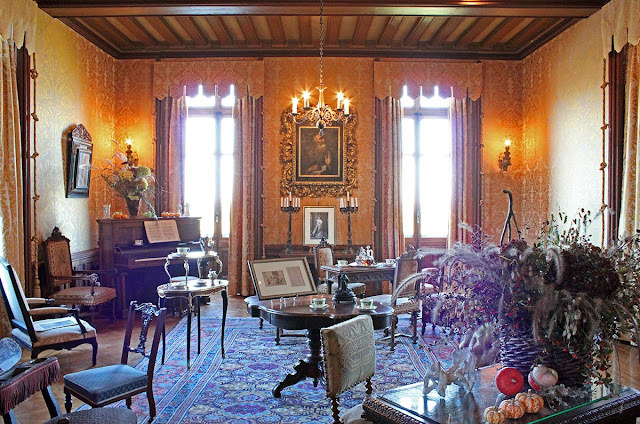 I have been inside the château several times. In my opinion, it's worth doing, maybe once. 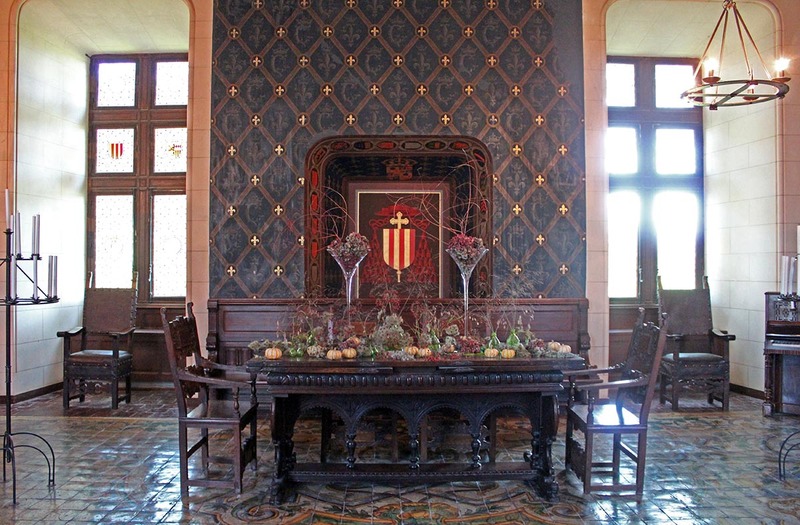 But the castle is cavernous and mostly empty (not much furniture), so you really have to be into the architecture and have a good imagination to enjoy it. Not to mention a lot of time, since it takes a while to explore. 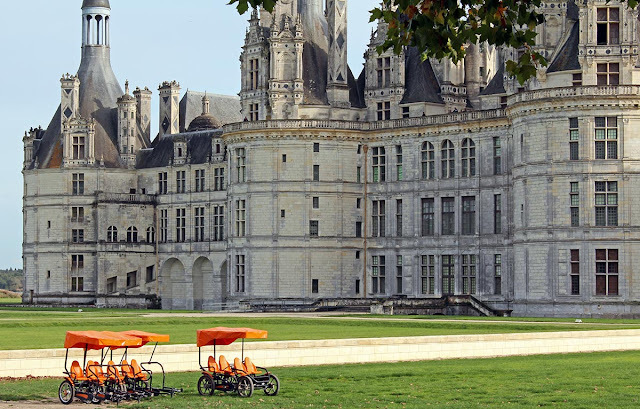 You can rent these pedal-cars and ride around the grounds of Chambord. I advise visitors that, especially if they have a limited amount of time, other castles are more worth the entrance fee than this one. 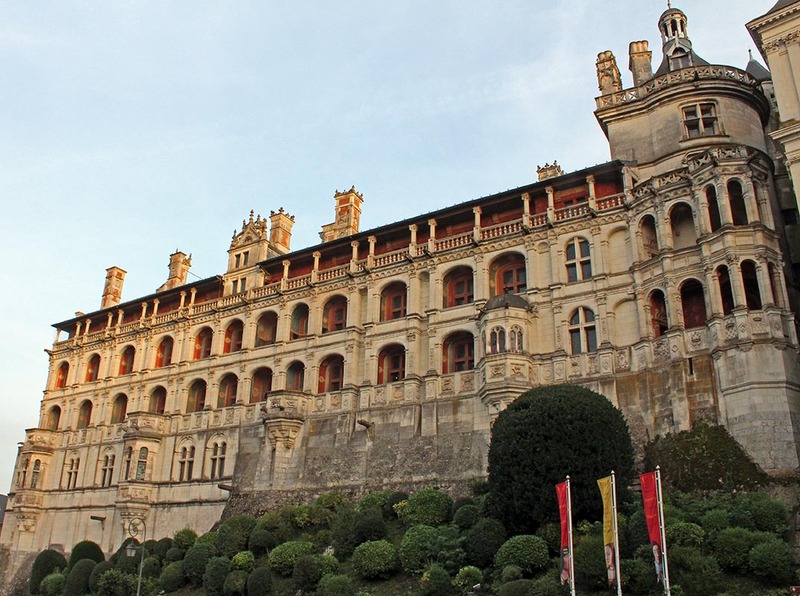 Chambord is definitely worth seeing, but mostly from the outside. Here it is, what I like to call the grand-daddy of all the Loire Valley châteaux. I was there a week ago with some friends who were in town from California. We didn't go inside but took a leisurely walk around the exterior. Chambord castle on a mostly sunny afternoon last week. Notice how tiny the people are off to the right. Click on the picture to royalize... you really want to. Before our walk, we ate lunch at one of the little places among the souvenir shops on the grounds. The plat du jour was a chicken tagine which my friends ordered. I had a galette (savory crêpe) stuffed with cheese and ham and a green salad along side. Tasty! Just before lunch, I took C. and A. to one of our local wine co-ops for some tasting. I needed to buy some wine and I thought they'd enjoy tagging along. 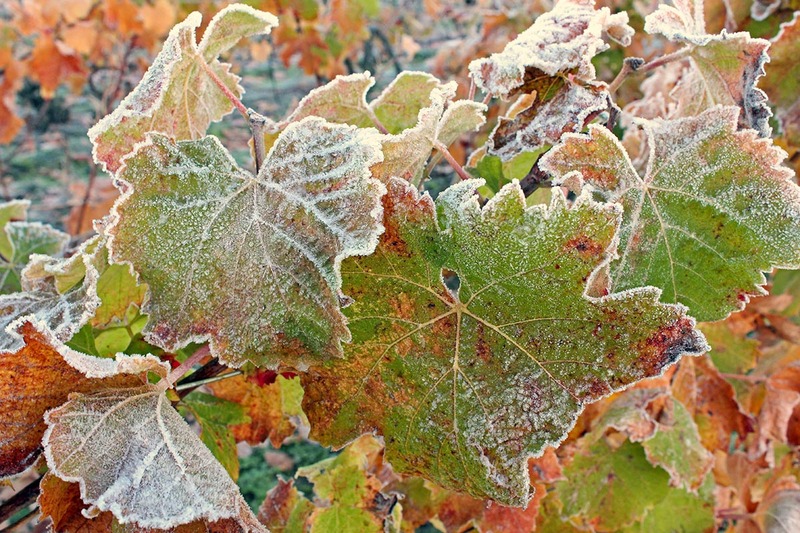 We tasted at least four wines: two sauvignon blancs, a gamay, and a côt. Then we bought a bunch. 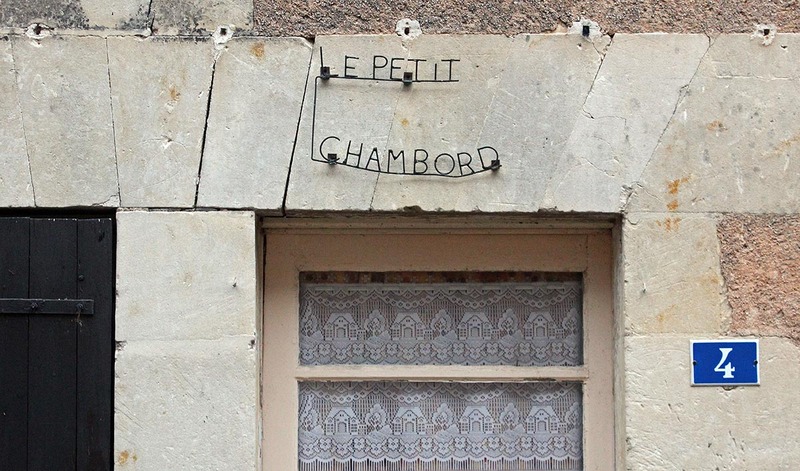 This small townhouse in Le Grand-Pressigny shares its name with one of the biggest and grandest of the Loire Valley châteaux: Chambord. I like the typical lace curtain in the window. Curtains like this are mass-produced and often sold from a large roll. The pattern is such that the curtain can be cut to almost any length. It does say "little." Click on the picture to see the curtain in more detail. So this wraps up my photos from LG-P for now. Not bad for a half-hour walk in the rain. 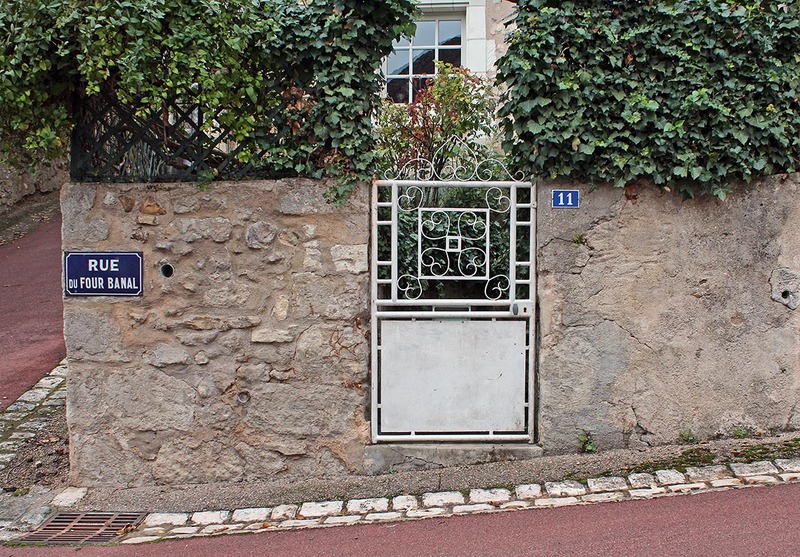 This inviting garden gate in Le Grand-Pressigny caught my eye. It's on the rue du Four Banal (Common Oven Street), which is a rather steep street that leads up to the castle. 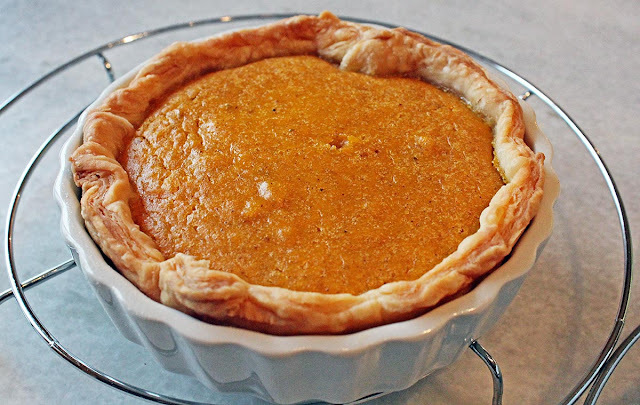 Back in the days when people didn't have a lot of appliances, they would take their covered dishes to the common oven for baking. I'd love to see inside the garden. It's small, but I'll bet it's worth a peek. There's a rue du Four in Saint-Aignan as well, but the actual four banal (common oven) no longer exists. When I was a student in Paris back in the middle ages (ok, it was 1981), I lived in a boarding house on the rue du Four in the Saint-Germain neighborhood. 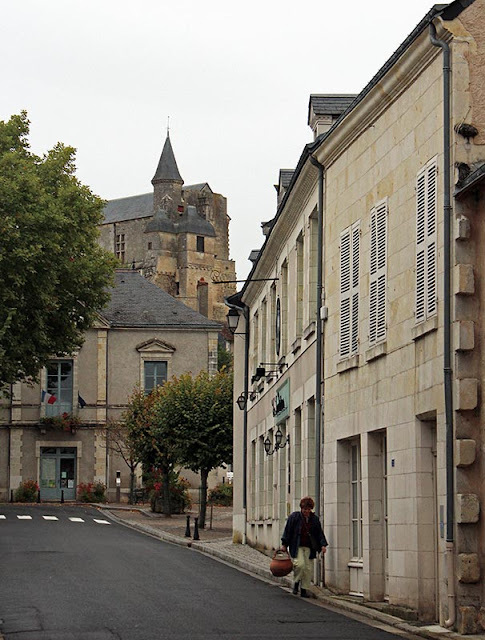 This woman was walking home (I presume) from the main square in Le Grand-Pressigny that evening when I was out with the camera. She must have been to one or more of the shops and would have been carrying her purchases in the basket. If she was coming from the butcher shop, she might very well have had a bit of poitrine fumé (bacon), a staple in French cuisine. An official looking building with the flags out front. I think it's town hall, but also the tourist office. You can see some parts of the castle that dominates the heights above the town. It's a very nice château, but much of it is just ruins. Still, the town has built a very modern prehistory museum on the site that integrates beautifully with the other buildings and ruins. Worth a stop if you're in the area. Today is la Toussaint (All Saints Day) and it is a national holiday in France. 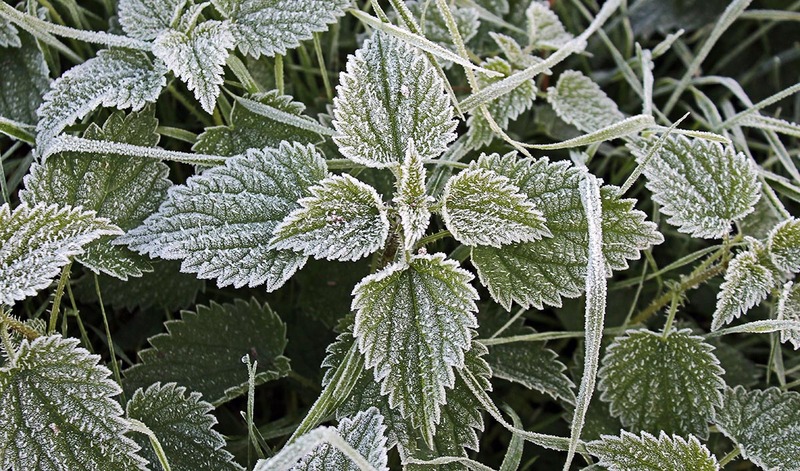 It's also the first day in a forecast series of weather systems rolling across the country. We woke up to blustery conditions with rain tapping on the roof. 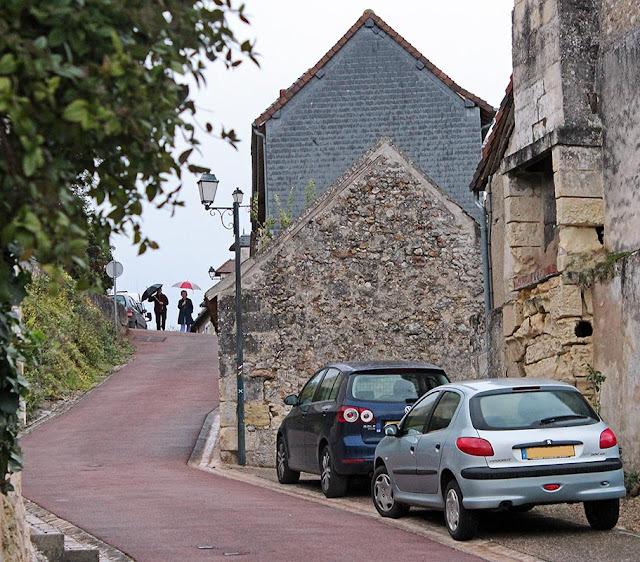 That's our little Peugeot parked on the street. I obscured the license plate number to protect the innocent. 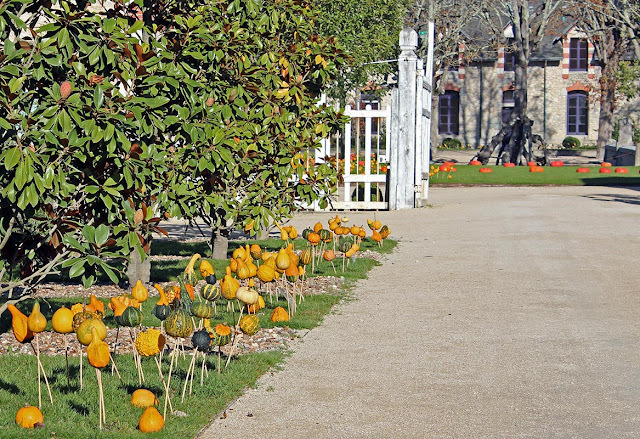 This photo is from a few weeks ago in Le Grand-Pressigny when it was also raining, albeit less than it is right now. I saw these folks coming down the street with their umbrellas open and thought it was a nice perspective. Immediately after I snapped the picture, they folded their umbrellas and ducked into a house.